Participation in the speed dating portion only. Use promo code: SPEED50. Networking/mingle portion only. Non-speed dating participant. YOU MUST PAY TO BE A SPEED DATING PARTICIPANT! 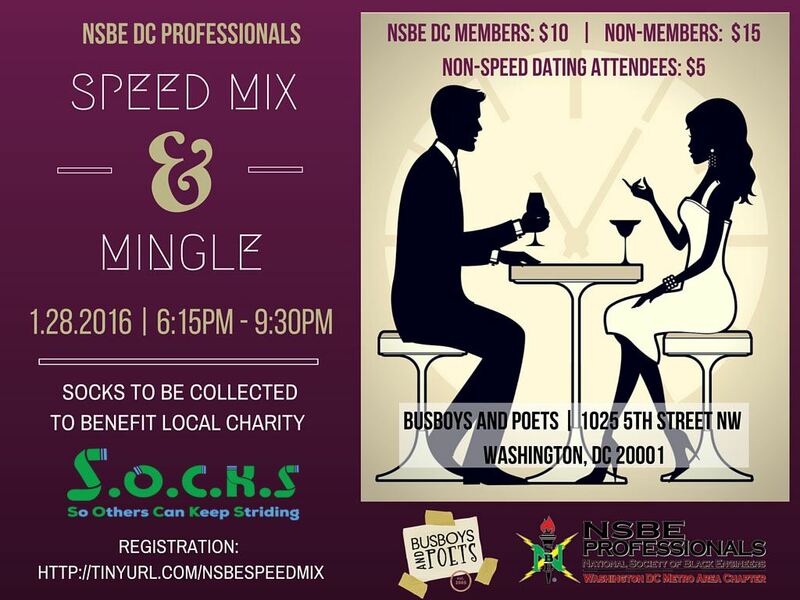 NSBE DC presents the Speed Mix and Mingle as an opportunity for NSBE members and other professionals in the DC area to connect and get to know one another in a calm, relaxed setting. Music will be provided to create an ambiance conducive to socializing. Our host for the Speed Mix and Mingle is November's Member of the Month Willie Hill! UPDATE: Please note speed dating and general attendance for women is SOLD OUT, we are still seeking men to join speed dating. Small appetizers will be provided, but food and drink will be available for purchase at Busboys. Street parking and nearby parking lot available. For more information about this event, please reach out to the NSBE DC Membership Chair, Darah Bishop at membership@nsbedc.org, or event host, Willie Hill at Willie.hill@gmail.com.